I’m all about spending my time efficiently, and I want to be respectful of yours as well, so I’ve devised a short quiz that will help you determine whether or not to read this article. 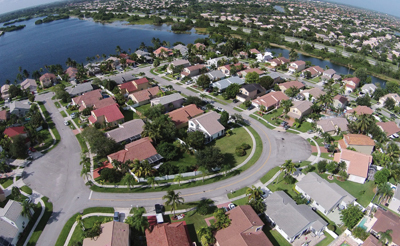 Are you an HOA board member or property manager? Does your community (or client’s community) have roads that have been resurfaced in the last five years or will need to be resurfaced in the next five years? Last one: would it interest you to reduce the amount of reserve funding required annually for those roads? If the answer to these questions is ‘yes,’ please continue. By the end of this article, you will be able to appreciate and successfully communicate the value of road preservation and calculate the return on investment (ROI) for performing preventive maintenance on your HOA’s roads. As such, HOA boards, property managers, and residents need to determine whether or not it is of financial benefit to take care of their roads throughout their life, or more financially sound to allow them to fail, and then rebuild them. ROI is a popular performance measure used in all corners of the business and economic world. Its popularity is as easy to understand: the formula simply takes the benefit or return (in this case, dollars saved) of an investment; subtracts from it the cost of the investment; then divides that total by the cost of the investment. If you want to save money and maximize the return on your investment in your roads, you need to understand the deterioration of pavement over the life of the road. On page 40 is the same graph the Federal Highway Administration uses, and it illustrates that the first 40 percent drop in the quality of a road happens over 75 percent of its service life. The second 40 percent drop happens in only 12 percent of the life of the roadway. So for much of a road’s life, it remains in good condition. But once it gets to the 12–15-year mark, the deterioration rapidly picks up steam; and by year 20, the road has completely failed. In Florida our roads, much like our tourists, bake in the sun, and this oxidative effect ultimately causes our roads to fail. That is why “top of the curve” preservation is so important. For every one dollar per square yard you invest at the top of the curve, you can save from four to ten dollars per square yard at the bottom of the curve. If you examine the pavement condition level as indica-ted on the right side of the chart (toward the end of the pavement life), you will see that the higher the asphalt condition level in the later years, the lower the replacement cost will be. Step 1: Take the original rehabilitation cost of $235,000 and calculate the replacement cost at the end of the road’s 20-year design life, adjusting for inflation (I used two percent). That gives you $349,198 or (divided by 20) $17,460 per year for required reserve funding. Step 2: To see how preservation at the right time extends pavement life, you need to know the amount of life extension provided and the cost adjusted for inflation. In this example, the cost of rejuvenation will be $18,735 in year three and $20,279, when retreated in year eight. Research indicates that rejuvenation extends pavement life from four to five years per treatment, so, in this case, for an investment of $39,014, road life is extended from eight to ten years. Step 3: Using the average life extension of nine years, we can estimate a total pavement life of 29 years (the original 20 plus nine additional years gained through retreatment). Step 4: If you calculate the new replacement cost in year 29, adjusted for inflation, to be $352,007, and compare it with the originally anticipated replacement cost at year 20 of $349,198, you can see a 25 percent cost reduction gained through asphalt preservation. That means the annual reserve funding ($352,007 divided by 29) is now only $12,138, compared with annual reserve funding of $17,460 for a 20-year road that has not been preserved. Step 5: The difference between those two numbers is $5,322 per year, which, when multiplied by 29 years gives you a total savings of $154,330. Step 6: If you take your total savings ($154,330), subtract from it the cost of your investment ($39,014), then divide it by the cost of the investment ($39,014), you get 2.95, representing a return on investment of 295 percent! To achieve a nearly 300 percent return on investment in the example provided, we used a maltene-based asphalt rejuvenation system that returns to the pavement those fractions of the asphalt binder (the “glue” that holds the pavement together), which are lost through aging and oxidation. Cities and counties in Florida routinely use rejuvenation as their first “top of the curve” strategy, but there are many tools available to extend the life of asphalt. The rule of thumb is to use the right treatment on the right road at the right time. 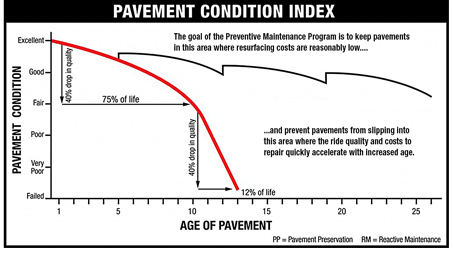 Pavements rated good or higher on the pavement condition index (PCI) are good candidates for rejuvenation. This method offers the highest return. With conditions in the fair to good zone, asphalt emulsion sealers, such as a high-density mineral bond (HA5), can sometimes be used; and if the roads need minor leveling, micro-surfacing is an option. The most important thing to remember is: the further down the deterioration curve (poor or lower), the more likely it is that a total resurfacing or even reconstruction will be your only option, representing a significantly higher cost. A properly performed ROI calculation demonstrates that, when it comes to asphalt roads, extending the service life of your fixed assets through preservative maintenance saves valuable dollars. Calculating the ROI for your roads investment will enable you to adopt a strategy that provides the lowest total cost of ownership for your fellow HOA board members and residents. This preservation strategy can be integrated into your reserve studies and long-term asset management. Calculating the return on investment for your community’s roads will prove that good roads cost money, but bad roads cost more. If you keep this in mind, your community will achieve the ultimate ROI: happy roads and happy residents! Chris Evers has served as a technical representative for Pavement Technology Inc. since 2011 and has been involved in the road building business since 1996. 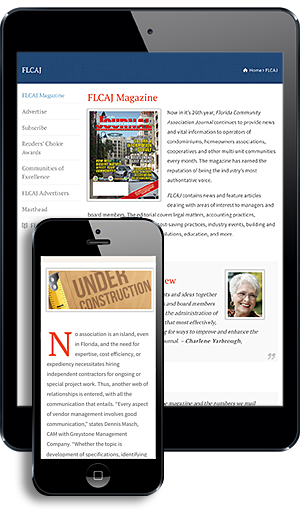 He is a past president of the APWA Florida Chapter, and an active participant on its Legislative Affairs committee. He founded and continues to moderate the annual APWA International Public Works Director Roundtable and was also instrumental in founding the Florida Pavement Preservation Council. Evers is a popular pavement preservation educator/speaker throughout Florida and resides in Vero Beach. For more information on Pavement Technology, visit www.pavetechinc.com or contact Evers via info@pavetechinfo.com.